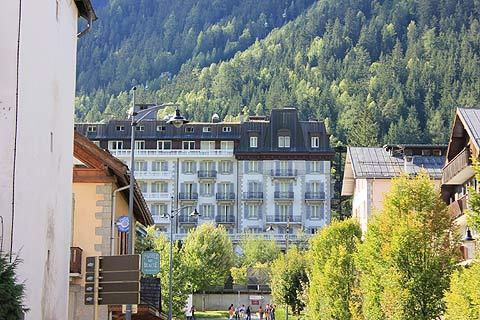 The resort of Chamonix-Mont-Blanc is in the Haute-Savoie department of the Rhone Alps region. 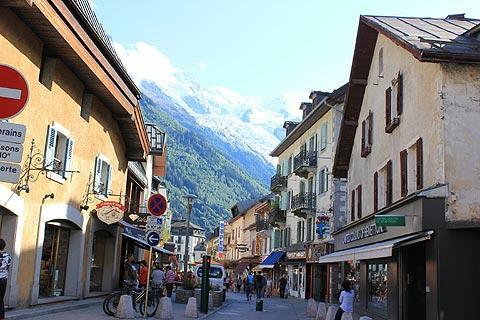 Chamonix is best known for two things: Mont Blanc, the highest mountain in France, stands at the edge of the town; and the town is a very popular Alpine Ski resort. 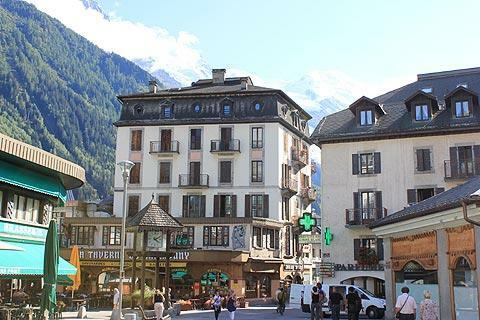 Chamonix has a history dating back 500 years, and more than most ski resorts, you do get some sense of history from staying in Chamonix and there are some traditional buildings in the centre. 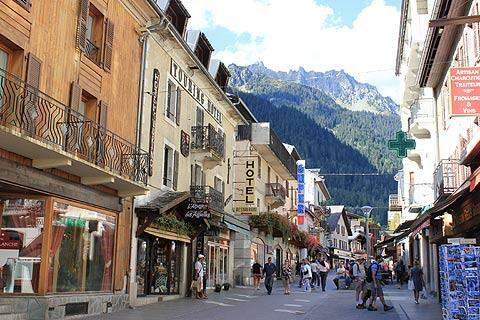 France This Way comment: whilst Chamonix has grown over the years, it has managed to keep a real alpine charm and wandering through the town is a real pleasure. 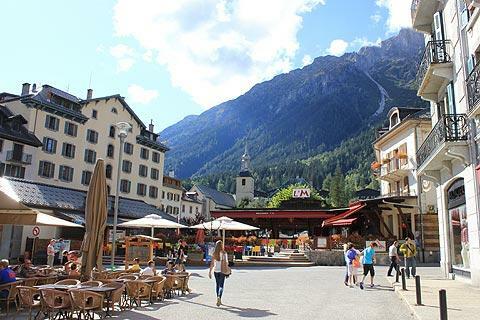 The transition from quiet village to major resort started in the early 20th century, culminating in the Winter Olympics at Chamonix-Mont-Blanc (the name had changed in 1916), but you should be aware that it is not only visited in the winter: the town is busy all year round with those seeking to enjoy outdoor activities in the stunning settings that surround the region. 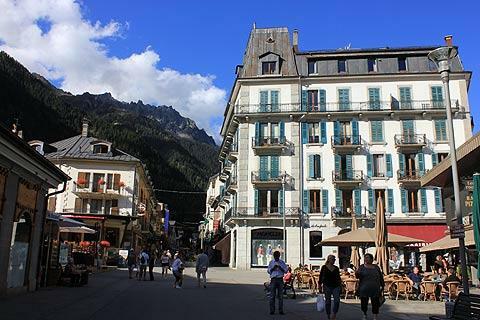 Although you will spend a lot of time in the surrounding mountains, Chamonix town also has all the shops and restaurants that you need after a day of sport. While in the town look out for the building with the huge mural painted on to its side. All the figures represented in the painting are famous figures in Mont Blanc's history starting at the top with Marie Paradis, a waitress and the first woman to reach the summit of Mont Blanc (1808). It would be impossible to describe all the many possibilities for skiing, hiking, outdoor activities and enjoying the spectacular scenery here, but be assured they are numerous! 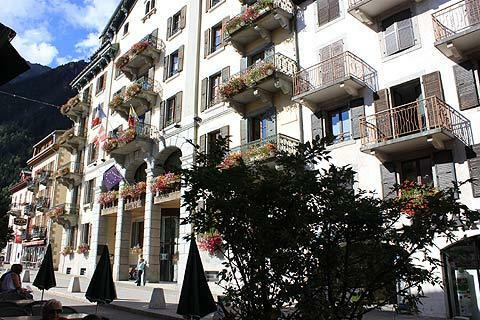 As you expect of one of the most famous ski resorts Chamonix offers skiing for every level but it also offers much more. As well as down-hill skiing you can try Nordic (cross-country) skiing, freeriding, snowshoeing (mountain walking with snow shoes), ski-touring with tours of one to several days, snowboarding, skijoring (skiing whilst being pulled by a horse) and driving a dog team. In summer the list of activities around Chamonix includes hiking, golf, paragliding, canyoning, rafting, hydrospeed, mountain climbing and fishing as well as lots more. There is even a summer sledging track! 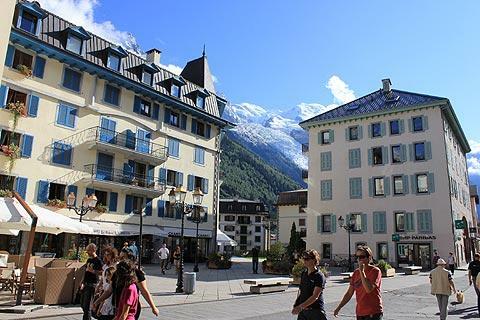 Of course, the opportunity to see Mont Blanc itself also attracts many visitors. One excursion that is expensive but well worth the expense, vertigo permitting, is the cable car to the Aiguille du Midi. In the middle of summer about 5000 people a day take this cable car! When you get to the top there is a spectacular viewing station giving 360° views over Mont Blanc and the French, Swiss and Italian Alps. For different views of the mountains and of Mont Blanc there are a number of other cable cars taking you to different places, all with fabulous views at the end of the journey. Another excursion is to take the Montenvers - Mer de Glace railway from Chamonix to the Sea of Ice. A grotto is cut into the heart of the glacier each year allowing you to stand right inside the glacier. There is also an exhibition showing the best of the crystals found on the slopes of Mont Blanc. You can even take the tram up the mountain. The tram goes to the Nid d'Aigle mountain hut at an altitude of 2380m. From here you get fab views of the Bionnassay Glacier and the Chamonix and Les Contanimes valleys and its also the starting point of some good hikes. The views are awesome, across the mountains that continue into the distance and the 'trademark' needles and jagged rocks in the foreground. Another particularly impressive view of Mont Blanc (weather permitting) is from Nid d'Aigle (Eagle's nest), a viewpoint reached by tram from Le Fayet, west of Chamonix. 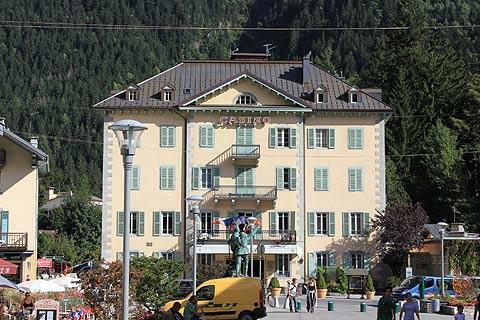 Chamonix was 'discovered' in 1741 by William Windham and Richard Pockock, two British aristocrats. Rich tourists followed them, keen to see for themselves the 'Mer de Glace', 'the Sea of Ice'. The first auberge opened in 1770 and in 1786 Mont Blanc was famously scaled for the first time bringing a surge of interest in alpine scenery and sport. The first luxury hotel was built in 1816 and summertime tourism gradually increased. A real surge in tourism came with the opening of larger roads to Chamonix and the railway. The first ever Winter Olympics took place in Chamonix in 1924. There followed the construction of a number of ski-lifts and cable cars including those of des Glaciers, de Planpraz, de Brevent, de l'Aiguille du Midi and de la Flegere. The winter ski-season at Chamonix took off. The building of the Mont Blanc tunnel at Chamonix also makes this an important crossing point for tourists into and out of Italy. 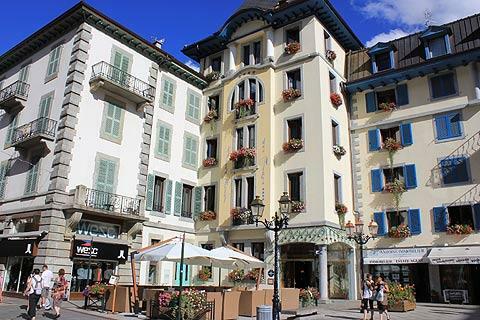 Chamonix is close to another famous ski-resort at Megeve. The Gorges de la Diosaz at the nearby village of Servoz is easily accessible and the path takes you into some spectacular scenery. 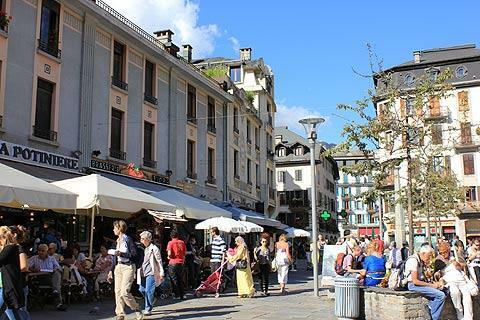 There is a regular bus service to the Italian town of Aosta with its medieval and Roman past. Emosson in Switzerland is only 19 km away and from here you can go on the steepest funiculair in the world (87%). 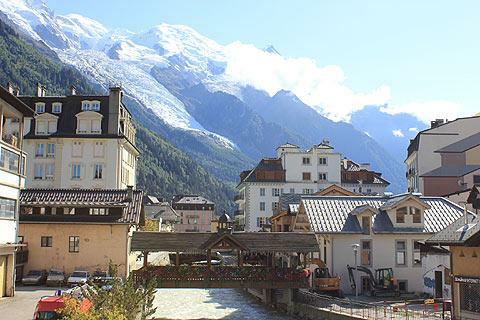 Relax in the thermal baths of St Gervais at the neighbouring village of Le Fayet.